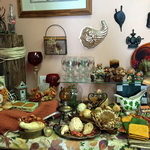 We are a small boutique Thrift Store with a large variety of items in our store. Our Thrift Store supports all the Community Assistance programs for Nancy’s Hope Community Center. Generous donations keep the store well stocked with wonderful new and gently used items just waiting for you to discover. Children are always welcome to come and play in our new playroom while you shop!